The Neighborhood Of Downtown L.A. 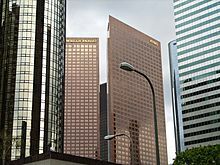 Downtown Los Angeles is the central business district of Los Angeles, California, located close to the geographic center of the metropolitan area. The area features many of the city's major arts institutions and sports facilities, sightseeing opportunities, a variety of skyscrapers and associated large multinational corporations and an array of public art and unique shopping opportunities. Though Downtown is generally thought to be bounded by the Los Angeles River on the east in Lincoln Heights, the Hollywood (101) Freeway to the north, the Santa Monica (10) Freeway on the south and the Harbor (110) Freeway on the west, some sources, including the Los Angeles Downtown News and Los Angeles Times, extend the area past the traditional boundary to include University Park and Exposition Park, encompassing the University of Southern California (USC) and Central City West neighborhoods. The earliest known settlements in the area of what is now Downtown Los Angeles was by the Tongva, a Native American people. Later European settlement arrived after Father Juan Crespí, a Spanish missionary charged with exploring sites for Catholic missions in California, noted in 1769 that the region had "all the requisites for a large settlement." On September 4, 1781, the city was founded on the site that currently holds La Placita Olvera. Land speculation increased in the 1880s, which saw the population of the city explode from 11,000 in 1880 to nearly 100,000 by 1896. Infrastructure enhancements and the laying of a street grid eventually brought development south of the original settlement into what is today the Civic Center and Historic Core neighborhoods. By 1920, the city's private and municipal rail lines were among the most far-flung and most comprehensive in the world in mileage, rivaling that of New York City, as shown (and parodied) in the 1988 film Who Framed Roger Rabbit. By that year, a steady influx of residents and aggressive land developers had transformed the city into a large metropolitan area, with Downtown at its center. Rail lines connected four counties with over 1,100 miles of track. During the early part of the 20th century, banking institutions clustered around South Spring Street, forming the Spring Street Financial District. Sometimes referred to as the "Wall Street of the West," the district held corporate headquarters for financial institutions including Bank of America, Farmers and Merchants Bank, the Crocker National Bank, California Bank & Trust, and International Savings & Exchange Bank. The Los Angeles Stock Exchange was also located on the corridor from 1929 until 1986 before moving into a new building across the Harbor (110) Freeway. Commercial growth brought with it hotel construction—during this time period several grand hotels, the Alexandria (1906), the Rosslyn (1911), and the Biltmore (1923), were erected—and also the need for venues to entertain the growing population of Los Angeles. Broadway became the nightlife, shopping and entertainment district of the city, with over a dozen movie houses built before 1932. Department stores also opened flagship stores in Downtown, including The Broadway, Hamburger & Sons, May Company, JW Robinson's and Bullock's, serving a wealthy residential population in the Bunker Hill neighborhood. Numerous specialty stores also flourished including those in the jewelry business which gave rise to the Downtown Jewelry District. Among these early Jewelers included the Laykin Diamond Company (later becoming Laykin et Cie) and Harry Winston & Co. both of which found their beginnings in the Alexandria Hotel at 5th and Spring Streets. The Los Angeles Union Passenger Terminal (Union Station) opened in May, 1939, unifying passenger service among various local, regional and long-distance passenger trains. Following World War II, suburbanization, the development of the Los Angeles freeway network and, subsequently, increased automobile ownership, led to decreased investment in Downtown. Many corporate headquarters slowly dispersed to new suburbs or fell to mergers and acquisitions. The once-wealthy Bunker Hill neighborhood became a haven for low-income renters, its stately Victorian mansions turned into flophouses. From about 1930 to the 1960s, numerous very old and historic buildings in the Plaza area were demolished to make way for street-level parking lots, the high demand for parking making this more profitable than any other option that might have allowed preservation. The drastic reduction in the number of residents in the area further reduced the viability of streetfront businesses that would be able to attract pedestrians. For most Angelenos, Downtown became a drive-in-drive-out destination as they would come into the area for a particular objective, and then leave immediately once their business was completed. In an effort to combat blight and lure businesses back to Downtown, the Community Redevelopment Agency of the city of Los Angeles undertook the Bunker Hill Redevelopment Project in 1955, a massive clearance project that leveled homes and cleared land for future commercial skyscraper development. This period saw the clearing and upzoning of the entire neighborhood as well as the shuttering of the Angels Flight funicular railway in 1969. Angels Flight resumed operation in 1996 for a period of five years, shutting down once again after a fatal accident in 2001. On March 15, 2010, the railway once again opened for passenger service following extensive upgrades to brake and safety systems. With Class A office space becoming available on Bunker Hill, many of Downtown's remaining financial corporations moved to the newer buildings, leaving the former Spring Street Financial District devoid of tenants above ground floor. Following the corporate headquarters' moving six blocks west, the large department stores on Broadway shuttered, culminating in the 1980s. 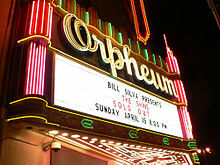 However, the Broadway theaters saw much use as Spanish-language movie houses during this time, beginning with the conversion of the Million Dollar Theater in the 1950s to Spanish-language film. Because of the Downtown office market's migration west to Bunker Hill and the Financial District, many historic office buildings were left intact, simply used for storage or remaining empty during recent decades. In 1999, the Los Angeles City Council passed an adaptive reuse ordinance, making it easier for developers to convert outmoded, vacant office and commercial buildings into renovated lofts and luxury apartment and condo complexes. As of early 2009, 14,561 residential units have been created under the adaptive reuse ordinance, leading to an increase in the residential population. With 28,878 residents in 2006 and 39,537 in 2008, a 36.9% increase, Downtown Los Angeles is seeing new life and investment. Staples Center, which opened in 1999, has contributed immensely to the revitalization plans, adding 250 events and nearly 4,000,000 visitors per year to the neighborhood. Since the opening of the Staples Center, L.A. Live was constructed which includes the Nokia Theatre. A growing rail transit network centered in Downtown has increased mobility and access to jobs throughout the region. On August 7, 2007, the Los Angeles City Council approved sweeping changes in zoning and development rules for the Downtown area. Strongly advocated by Mayor Antonio Villaraigosa, the changes allow larger and denser developments Downtown; developers who reserve 15% of their units for low-income residents are now exempt from some open-space requirements and can make their buildings 35% larger than current zoning codes allow. Projects along the Figueroa Corridor such as Wilshire Grand Tower I are also being approved that will further the progressive revitalization of downtown; attracting businesses, tourists and new residents, and rivaling other spots, like Times Square. 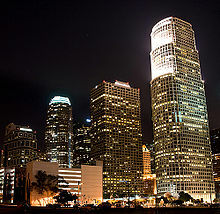 With the addition of new skyscrapers such as the Wilshire Towers, Downtown is slated to have a skyline in prominence rivaling those ranked among the top in the world. On the northeastern edge of Downtown Los Angeles, the bustling Los Angeles Union Station (known as the "Last of the Great Railway Stations") serves as the region's main transportation hub, with the convergence of six commuter rail lines, two subway lines, a light rail line, Amtrak service and multiple local and regional bus services. The station, opened May 1939, is a massive building in the Art Deco, Moorish and Spanish Mission styles, that serves a growing rail and bus passenger market. Station grounds include soaring ceilings, deep leather-and-wood chairs, and two adjoining greenspaces and fountains flanking the main passenger concourse. The Los Angeles Conservancy offers guided tours of Union Station for a small fee. Across Alameda Street from Union Station is the historic center of the city, El Pueblo de Los Angeles, enshrined as Olvera Street, a collection of historic shops, restaurants and several museums, as well as La Placita Olvera and Our Lady Queen of the Angels Church. The Old Plaza Firehouse is a museum dedicated to historic firefighting artifacts and memorabilia, including historical maps of the city of Los Angeles. The Chinese American Museum is located in the historic Garnier Building and features exhibits detailing the lives of Chinese Americans in early California as well as contemporary works by Chinese American artists. Philippe the Original, a 1908 eatery that lays a competing claim (along with Cole's Pacific Electric Buffet) to the invention of the French dip sandwich, is among the oldest eateries in the city. 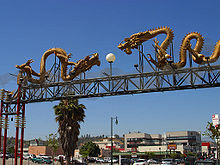 North and west of Union Station lies Chinatown, a mixed-use district of restaurants, nightlife, art galleries, trinket shops, a branch of the Los Angeles Public Library system and residences. The neighborhood is accessible via the Metro Gold Line Chinatown Station. Centered along North Broadway and North Hill Street, Chinatown Central Plaza, also known as "New Chinatown," is the central gathering place in the neighborhood. Operated by the Chinese Historical Society of Southern California, the Chinatown Heritage & Visitors Center is open to the public and aims to share the Chinese-American history of the Los Angeles area. 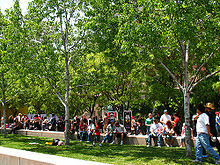 Los Angeles State Historic Park, Downtown's largest greenspace, lies north of the light rail station on North Spring Street. Despite the suburbanization of Southern California's Japanese Americans over the past several decades, Little Tokyo remains the cultural heart of the Japanese American community. The neighborhood is home to several Buddhist temples, dozens of shops, restaurants and taverns, two museums, and a branch of the Los Angeles Public Library system. Little Tokyo is accessible via the nearby Metro Red/Purple Line Civic Center Station, and the Little Tokyo light-rail station on the Metro Gold Line. Pedestrian activity in the neighborhood is centered around the Japanese Village Plaza, an open-air shopping area spanning First and Second streets. The center is home to Nijiya Market, Mikawaya Ice Cream, Yamazaki Bakery and several other stores and eateries, as well as a landmark watchtower on First Street. Historic First Street is an active restaurant row, with many establishments specializing in Japanese ramen noodles. Fugetsu-do, a century-old establishment that specializes in mochi, a Japanese rice-based snack, is located on this corridor. Weller Court is a retail complex anchored by Marukai Market at the intersection of Second and San Pedro streets. Three levels of Japanese-themed shops and restaurants face an interior courtyard. The shopping center also features a memorial to the seven crew members killed in the Space Shuttle Challenger disaster. The Japanese American National Museum (JANM) is Little Tokyo's largest cultural facility and plays host to several exhibits detailing the plight of Japanese American citizens during the World War II era, as well as historical perspectives and contemporary works by Japanese American artists. 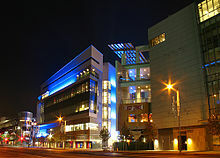 Little Tokyo is home to a secondary campus of the Museum of Contemporary Art (MOCA), the Geffen Contemporary. Los Angeles City Hall, 2009. Los Angeles's Civic Center is the government center of the city and is home to several federal, state, county and municipal administrative buildings. 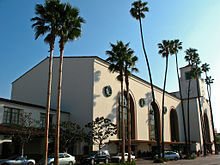 The main office of the Los Angeles Times is located in the district. The neighborhood is accessible via the Metro Red/Purple Line Civic Center Station. The new Los Angeles Police Department Police Administration Building, designed by DMJM Architects, replaced the aging Parker Center, which is slated for demolition. A public park is located on the Second Street side of the building. As part of the Caltrans District 7 Headquarters project, a public art project was placed in the entrance plaza. The large-scale artwork uses a series of neon tubes to mimic the flow of traffic on a freeway. The Los Angeles Mall (park) stretches between City Hall on the east and the Los Angeles Music Center on adjoining Bunker Hill. Plans call for a 16-acre (65,000 m2) replacement park designed by Rios Clementi Hale Studios. The plan includes a large community gathering space at the foot of City Hall, new gardens and green space between the Los Angeles County Hall of Administration and the court houses, and an overhaul of an existing fountain. An observation deck on the 27th floor of City Hall is open to the public on weekdays. Bunker Hill is the cultural heart of Los Angeles, with several arts schools, theaters and performance venues along Grand Avenue. Guided tours of the neighborhood are provided by the Los Angeles Conservancy for a small fee. The neighborhood is accessible via the Metro Red/Purple Line Civic Center Station. Central Los Angeles Area High School Number 9, a new performing arts school on Grand Avenue, is scheduled to open in September 2009. At $232 million, the high school is among the most expensive ever built in the United States and features a futuristic post-Modern design by Austrian architecture firm Coop Himmelb. The project is noted for its conical theater, spiral tower facing the 101 Freeway and glass-and-steel entryway on Grand Avenue. Acting as the headquarters of the Los Angeles Archdiocese, the Cathedral of Our Lady of the Angels at Grand Avenue and Temple Street was completed in 2002 after the nearby St. Vibiana's Cathedral was damaged in the 1994 Northridge earthquake. The 58,000-square-foot complex can hold 3,000 attendees and was designed by Spanish architect Rafael Moneo in a post-Modern style. A plaza and small park are open to the public. The Los Angeles Music Center is a complex of music and theatrical halls on the Grand Avenue cultural corridor between Temple Street to the north and Second Street to the south, including the Dorothy Chandler Pavilion, Mark Taper Forum, Ahmanson Theater and Walt Disney Concert Hall. 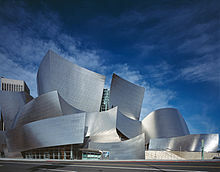 The Disney Hall opened in 2003 as the new home of the Los Angeles Philharmonic and the Los Angeles Master Chorale, increasing the number of major theaters at the Music Center to four. Also housed in the Disney Hall complex is the smaller REDCAT Theater and art studio. 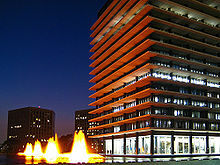 Architecture firm A.C. Martin designed the 1964 Los Angeles Department of Water and Power headquarters building at the intersection of First and Hope streets, which was later renamed the John Ferraro Building after the late City Councilman John Ferraro. It is noted for its iconic modern architecture and backlit fountains. South of the Music Center is the Museum of Contemporary Art (MOCA), the only museum in Los Angeles dedicated solely to contemporary artworks produced after 1940. The Colburn School of Performing Arts is a leading performance and music school, consisting of the School of Performing Arts and the Conservatory of Music. Dining and performances are available at the Water Court at California Plaza. Free outdoor concerts are scheduled during the summer, operated by the nonprofit Grand Performances. Several new restaurants have opened in the area in recent years. 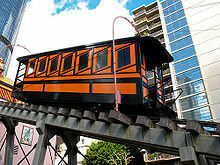 The historic Angels Flight funicular railway sits at the eastern portion of California Plaza. Re-opened in 2010, the twin rail cars Olivet and Sinai serve the Historic Core neighborhood. On a steep incline of Bunker Hill, the railway previously ran from 1901 to 1969, and 1969 to 2001. The Historic Core neighborhood is a heavily residential neighborhood of Downtown Los Angeles, and many of those residences are adaptive reuse loft units created from formerly vacant historic commercial and office buildings. The neighborhood is accessible via the Metro Red/Purple Line Pershing Square Station. The Old Bank District, centered around Fourth and Main streets, is a mixed-use loft district, with many of the historic buildings being converted to residential use under the city's adaptive reuse ordinance. At the same time, a growing number of restaurants, coffee shops, and bars are contributing toward the revitalization of this neighborhood. Downtown's Gallery Row is a city-recognized art gallery district in the Historic Core. Starting with three art galleries in 2003, Gallery Row claimed 50 art galleries as of 2009. The Downtown Art Walk is held on the Second Thursday of every month from 12 - 9 pm, and attracts nearly 5,000 attendees. The Bradbury Building, built in 1893, is the oldest office building in Los Angeles and features an interior courtyard with intricate wrought-iron staircases and railings, and a glass-and-iron ceiling. 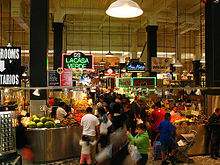 Grand Central Market, an open-air produce market and food court, captures a multi-ethnic, early-1900s feel, with vendors selling produce, spices, and ethnic meals in the ground floor of the 1905 Homer Laughlin Building. Cole's is the oldest existing restaurant in Los Angeles, opening in 1908. Known for its French dip sandwiches, along with Philippe's to the north, the restaurant and bar recently underwent a renovation with a new kitchen, chef, and restored bar. The Broadway Theatre District is a collection of historic movie palaces, some of which are undergoing renovation for use as performance spaces. 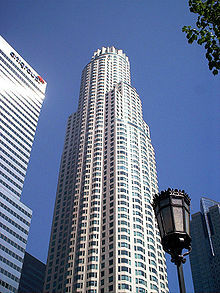 South of Bunker Hill is the Financial District of Downtown Los Angeles, the center for corporate headquarters and skyscrapers in Los Angeles. The neighborhood is accessible via the Metro Red/Purple/Blue Line 7th Street/Metro Center Station. The U.S. Bank Tower, formerly known as the Library Tower, is the seventh-tallest building in the United States, and the tallest building between Chicago and Auckland, New Zealand, at 1018 ft tall. Designed by architect I.M. 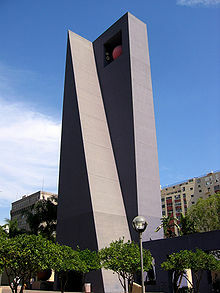 Pei and constructed in 1989, it was initially called Library Tower because the purchase of air rights from the Los Angeles Central Library, located across the street. The air rights purchase allowed a building of such height to be built and paid for a renovation and expansion of the Central Library. After suffering two arson fires in 1986, money from air rights purchased for the construction of the Library Tower was used toward expanding and renovating the Richard Riordan Central Library, which was built in 1926 in ancient Egyptian revival style. The library is the third largest in the United States. An ornate rotunda and exhibition gallery greet visitors on the second floor. Adjacent to the library is Maguire Gardens, a public greenspace and sculpture garden at the intersection of Fifth and Flower streets. At the base of Bunker Hill and the Library Tower lie the Bunker Hill Steps, a classically designed stairway consisting of 103 steps connecting the Financial District to Bunker Hill. The Bunker Hill Steps are often described as Los Angeles's version of Rome's "Spanish Steps." The Millennium Biltmore Hotel is one of the grandest hotels in Los Angeles, opening in 1923. The Beaux-Arts-style architecture and several historic ballrooms are a draw for sightseers and tourists. South Park is a growing residential and entertainment neighborhood consisting of the Los Angeles Convention Center, Staples Center and the mixed-use L.A. Live entertainment campus. The area has seen a revival due to an increase in new residential buildings and restaurants. The neighborhood is accessible via the Metro Blue Line Pico/Chick Hearn Station. The L.A. Live campus consists of over a dozen restaurants, an ESPN Zone arcade, the 7,100-seat Nokia Theatre, the 2,300-seat Club Nokia performance venue and nightclub, and the Latin-themed Conga Room nightclub. The Grammy Museum at L.A. Live opened in 2008 in conjunction with the 50th Anniversary of the Grammy Awards. The museum features many interactive exhibits, music memorabilia, and educational opportunities. As well as, a Seafood District and Produce District. 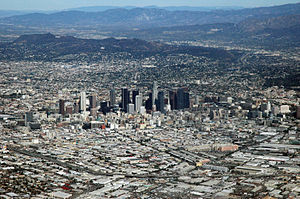 Despite its relative decentralization, Los Angeles has one of the largest skylines in the United States, and its development has continued in recent years. The skyline has seen rapid growth due to improvements in seismic design standards, which has made certain building types highly earthquake-resistant. Many of the new skyscrapers contain a housing or hotel component. The first height limit ordnance in Los Angeles was enacted following the completion of the 13-story Continental Building, located at the southeast corner of 4th and Spring streets. The purpose of the height limit was to limit the density of the city. There was great hostility to skyscrapers in many cities in these years, mainly due to the congestion they could bring to the streets, and height limit ordinances were a common way of dealing with the problem. In 1911, the city passed an updated height limit ordinance, establishing a specific limit of 150 feet. Exceptions were granted for decorative towers such as those later built on the Eastern Columbia Building and United Artists Theatre, as well as the now-demolished Richfield Tower. Though it is commonly believed that the height limits were imposed due to the risk of earthquakes, such limits were actually enacted to allow California's natural sunlight to penetrate to sidewalk level, avoiding the "urban canyon" effects of New York and Chicago. It is notable that the first limit was imposed in 1904, two years before the 1906 San Francisco earthquake, and that even after that seismic event it was believed that Southern California was not subject to such violent temblors, despite evidence to the contrary. The 1911 ordinance was repealed in 1957. The first private building to exceed the old limit was the 18-story California Bank Building, located at the southeast corner of 6th and Spring streets. Additionally, several semi-public open spaces sit on private property. Public access may be restricted at certain times. The Water Court at California Plaza, an outdoor performance and dining space with modest water features, fountains, shaded seating areas and an amphitheater. Several future park proposals in Downtown make use of public-private partnerships between developers and the city of Los Angeles, including a public park at the proposed Nikkei Center development in Little Tokyo; a 1-acre park at the Medallion development in the Historic Core; and a pocket park at the Wilshire Grand Hotel replacement project, currently in the planning phase. Additionally, the city of Los Angeles is in the planning stage on a new park to be located on the 400 block of South Spring Street in the Historic Core neighborhood.